Justin Trudeau mourned the loss of his younger brother Michel. A tweet shows his younger self- with messy, unkempt hair and dressed in a plain red and white striped sweatshirt with 'Canada' emblazoned on it- posing with his younger brother. In a touching tribute, Justin Trudeau today mourned the loss of his younger brother Michel. 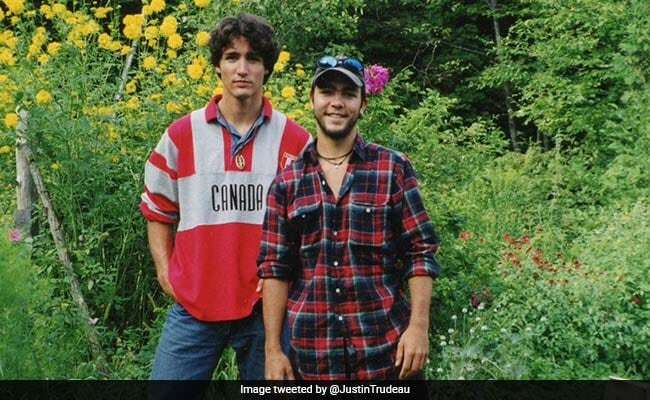 A tweet by the Canadian Prime Minister, shows his younger self- with messy, unkempt hair and dressed in a plain red and white striped sweatshirt with 'Canada' emblazoned on it- posing with his younger brother, who is grinning. "I love you, little brother," he tweeted, remembering what would have been the 43rd birthday of the younger Trudeau, fondly known by his family as 'Miche'. "You would have been 43 today, but you've been gone 20 years now," he tweeted. Michel Trudeau was on a three-day backcountry ski trip in Canada's Kokanee Glacier Park with three other friends on November 13, 1998, according to Canada's state broadcaster CBC. An avalanche swept Michel away off the ski trail he was on. He landed in Kokanee lake, where he was presumed to be drowned, according to CBC. The Royal Canadian Mounted Police were unable to locate Trudeau's body after investigating the area two different times. A Canadian police official informed his father, Pierre Trudeau, the then Prime Minister of the country. He was "deeply shaken" by the accident, according to the CBC news report. "He was very quiet but he asked us to go on to do what we had to do to recover the body and to keep him informed," the CBC News report further said. Michel was wearing a heavy a heavy backpack and cold-weather clothing as he traversed a steep slope above Kokanee Lake with his friends when the avalanche hit. His friends had survived the ordeal. "There couldn't be a more heavenly place," Justin Trudeau's mother had said in 2001, on coming to terms with the place where her younger son had met his tragic end. "(We) have all been up there, and we feel it's a place that is as close to heaven on earth as you could imagine, and that our son is blessed to have his grave by Kokanee glacier," she had said. I remember your brother being my favourite liftie at @redresort in the 90s. I was a kid and he'd jokingly refuse to let me and my friends on the chairlift until we told him a joke. My thoughts are with you and your family today. Michel Trudeau was born in 1975 and graduated with a degree in marine biology from Dalhousie University in Canada's Halifax. "When it's my turn, just leave me down at the bottom of the mountain where I lie... His comment proved prescient: divers would never find his body, and he is there to this day," Justin Trudeau had said about his brother in a 2014 memoir.